Raiden is no Solid Snake. That doesn’t mean he’s the one of the worst video game characters ever, though. This is how I and many people felt about Raiden, Metal Gear Solid‘s main protagonist and one really huge twist on Kojima’s part. Many fans felt betrayed of this bait-and-switch tactic. We still loved it for the most part, but it was definitely disinheartening to control Raiden when we all had our hearts set on controlling the veteran and rugged Solid Snake. Fifteen years have passed since then and many fans have written off Raiden as one of the worst video game protagonists ever created. However, as much as I disliked Raiden, I’ve gradually grew to accept Raiden and I’m even willing to say that, although he isn’t part of the upper echelons when it comes to video game heroes, I will say he is, at least, the best “worst video game protagonists” ever. No one really complains about the way Raiden controls. Technically, Raiden is as good as Solid Snake ever was. He’s got pretty much all of the moves his predecessor has. Snake can sneak up on people and hold them up. Raiden can do that as well. Snake can now hang on ledges to avoid detection. So can Raiden. Snake can dive at his foes and bowl them over using a tuck and roll. Okay, Raiden has a prissy looking cartwheel… but it functions in the same way as Snake’s rolling tackle, so yes, Raiden can sort of do that, too. It’s actually quite impressive if you consider that he can do it while covering up his naughty bits while doing it. In this sense, even during his debut in the Metal Gear series as a rookie soldier on his first mission, Raiden is actually kind of a badass in his own right. He is, at least, as capable in combat situations as Solid Snake. However, it’s not that he controls differently than Snake. It’s that, well, he’s just not as cool as Snake. The biggest reason for the backlash against Raiden is, although he is as skilled as Solid Snake, he isn’t Solid Snake. Although Snake has already been in Metal Gear and Metal Gear 2: Solid Snake for the NES and MSX, there was something about his PlayStation incarnation that made him more than just your regular video game hero. Maybe a part of the magic of what made Snake a popular hero was that he was just one man dropped behind enemy lines. There’s a little more than just the situation and the missions he keeps undertaking to what makes Solid Snake the icon he is. Solid Snake was really fleshed out during Metal Gear Solid. Despite being a veteran of the battlefield, Snake just wants to retire from fighting but he still persists in returning to the field because he’s the best suited for the job. He’s been used by the very government that he works for but he still persists in fighting for them because the entire planet will suffer if he doesn’t. Even so, Snake still has a soft side. The nature of his sneaking missions shows that, while he will kill when necessary, he will try to avoid it. He’s actually forged friendships and made allies with Otacon and Meryl while on the battlefield. He’s even willing to forgive people like Naomi Hunter, someone who kept secrets from him. Raiden, on the other hand, was not given this benefit. 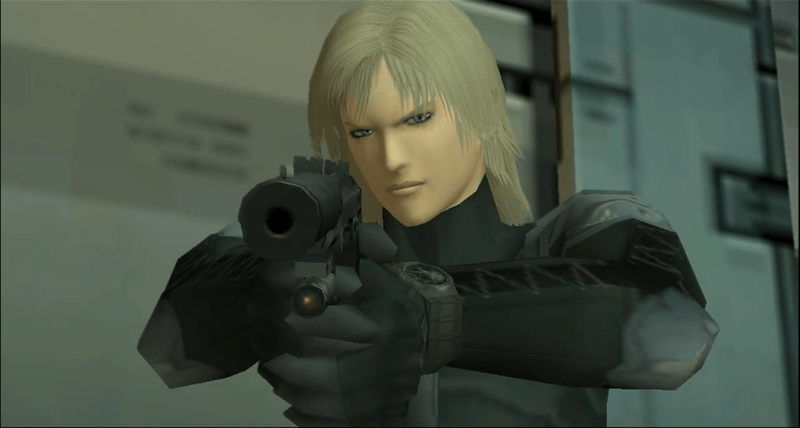 In his first appearance in Metal Gear Solid 2, Raiden came off as a stuck-up and arrogant pretty boy, cocksure of his skills as a stealth operative. He was preoccupied with trying to tackle his personal issues with Rose rather than focus on the mission that had the entire world at stake. He was an annoying, immature brat at the start of Metal Gear Solid 2. Compound this with being let down by the expectation of playing as Solid Snake, of course many fans didn’t like Raiden. It’s like landing a date with Emma Roberts and then realizing you actually made a date with Eric Roberts. In short, Raiden’s first impression sucked. And you all know what they say about first impressions: they last. It’s because of this terrible first impress that most people, including myself, forget is that Raiden actually matures and grows throughout the Plant mission of Metal Gear Solid 2. He may start out as a whiny pretty boy who just follows orders unconditionally at the start but he does eventually become a more self-reassured pretty man who is willing to think for himself. This is mostly due to being in close proximity to Solid Snake himself and learning from the legend himself. Actually, this is precisely why Raiden may not be as legendary as Solid Snake, but why he shouldn’t be regarded as a terrible character. One of the main reasons why Hideo Kojima wanted a younger protagonist for Metal Gear Solid 2 (besides fan feedback from female gamers that they didn’t like playing as an old guy) was he wanted a way to look at Solid Snake from a different angle. He wanted gamers to see the character, not the way we would normally see him, but from the viewpoint of a character in the game. And it definitely worked. We saw Snake as the tough and resourceful character that he is. Not through the decisions we made but through his own actions. And because of Snake’s actions, Raiden and, in effect, the player earned a new found respect for the real main character of the series. In fact, because you don’t get to control Solid Snake throughout the majority of Metal Gear Solid 2, it’s like the character became even more legendary. There are times when he disappears under the guise of SEAL Team member Iroquois Pliskin to do different things. But he does find time to assist Raiden with some advice, like how to use a cardboard box properly, as well as in the physical sense, like helping the rookie take out a Hind piloted by Vamp. Snake also somehow takes out Fortune, who has the ability to divert bullets, and possibly take out a Metal Gear RAY underwater! We never see the last two elements and we can only imagine how awesome those battles were. You can say that Raiden deprived us from experiencing those boss fight, but as the pretty boy was created so we, the players, can look at Snake in a different light, I guess he served his purpose. I have grown to like Raiden since his introduction 15 years ago. It took me a long while to get over his pretty boy looks and how wimpy he was when you compare him to a character like Solid Snake. However, to say that he’s an awful protagonist is definitely harsh. I will say that I still don’t like him a whole lot because I was forced to play as him instead of Solid Snake in Metal Gear Solid 2. He may not be as legendary as the great Solid Snake but, for a pretty boy, he’s alright. I’ve discovered MGS Serie by beginning with the 2nd episode and it remains until then the only MGS game I’ve ever played. After having quickly read your article and saw what the comments which are dissing at Raiden are about, I just see that people get angry because they were deprived from their deep-rooted habit of playing Snake. Nonetheless, the construction of Raiden character is amazingly rich, the dialogs with Rose are not there to expose their love problems but to lead the player to ask himself about the realness of this relationship. The story of MGS 2 is about FREE WILL, and all that is constructed about Raiden character head towards this issue (dialogs, cospirationnal story, dog tag names which are thown away in the end…). As a non accustomed to MGS serie, this character seemed to me rich enough to pursue the adventure, but the only negative comments about hil I’ve read about until now are just about the fact that players were deprived of their deep-rooted habits during a game despite the gameplay and the story respected MGS spirit. The most relevant issue that is enlighted by the player’s reactions about MGS 2 is that players are rarely focused on the topic, issues and the underneath speech in VG but mostly on if their habits are respected or not. *See it with GTA IV. Judging the quality of Raiden and any character cannot be done without linking this character to his purpose, as for MGS 2, Raiden is to me a good character as he enlights the problematic of free will thanks to the brilliant work of Kojima’s team and I’ve only judged him on it due to the fact that I had not deep-rooted habits about MGS 2 (as a new player of the serie).